You are here: Home / Misc / Our Kids Pizza Express party made the best birthday ever! Children love decorating pizzas. 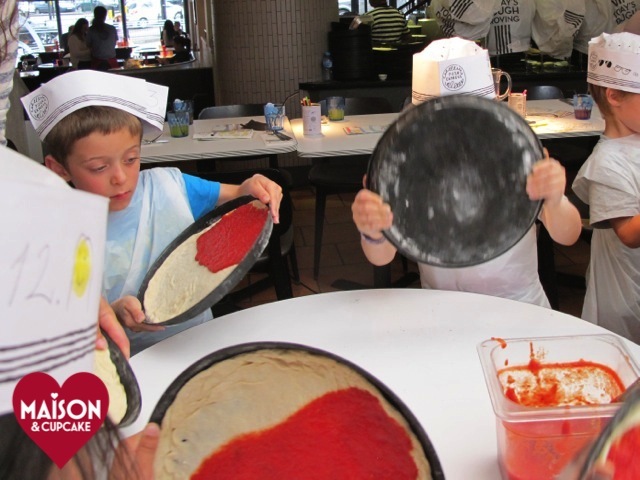 Here’s why kids Pizza Express parties make the perfect birthday party experience. 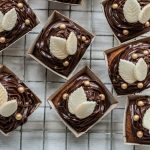 I looked into booking kids Pizza Express parties for Ted’s birthday last year but ended up doing my own cupcake decorating party under a wet gazebo. 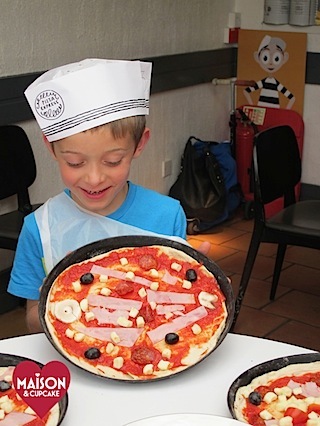 So this year, wanting an easier time and no chaos to clean up I marched straight into Pizza Express South Woodford to book a kids pizza decorating party for Ted’s seventh birthday. 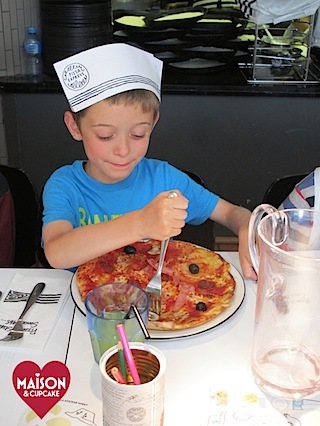 I was so impressed by kids Pizza Express parties, I would heartily recommend it for kids aged 6 upwards. Initially the kids are all frog marched upstairs to wash their hands. Then they are sat down and given hats and aprons. Every child is allocated a number on their hat that they can decorate with stickers and crayons. The pizzas will later be identified by small squares of paper coated in olive oil marked with each child’s hat number. After a starter of dough balls and vegetable sticks (and unlimited squash), a pizzaiolo chap from the kitchen in black and white stripy outfit comes and gathers the kids around some tables to make their pizzas. It hadn’t occurred to me how theatrical this would be. First the kids get told to prod their balls of dough around the edges. There is flour everywhere by the way. Next they bash their dough to flatten it. They get very excited doing this. Lots of excited hammering of little fists on tables. 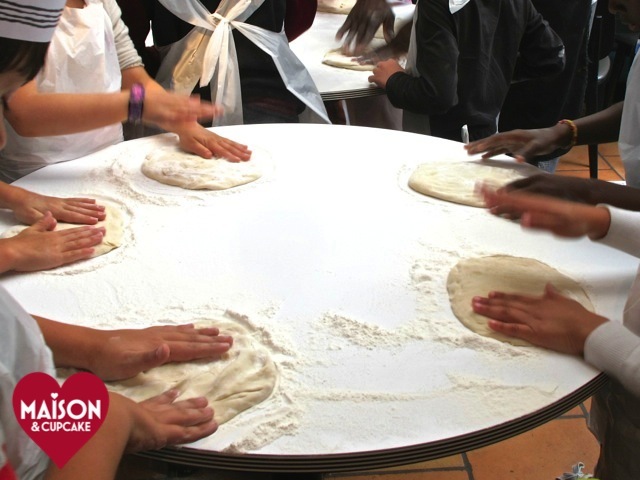 Then the pizzaiolo tosses his dough in their air and the kids all have a go too. Remarkably many of them are very good at it! Next the dough is pressed into oiled dishes. More bashing and prodding. Then everyone is allocated a ladleful of tomato sauce to physically shake across their pizza bases. I can’t tell you how funny this was to watch. Twelve seven year olds frantically shaking pizza plates up and down. 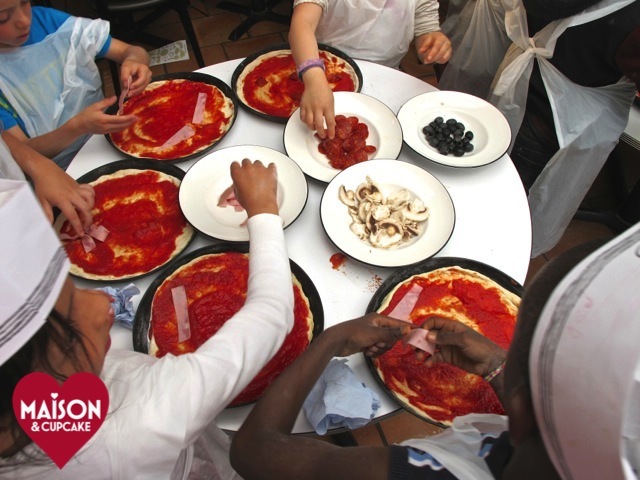 Finally a choice of toppings are brought over and the kids can pick and choose what to put on their pizza. The all important number on greased paper is allocated to each child’s pizza so they don’t get mixed up. Ted showing off his finished pizza before it goes into the oven. The kids are all marched back upstairs to wash their hands again and by the time they return the pizzas are ready to eat. Afterwards they get ice cream for pudding and we all gathered around the Sooty birthday cake for Happy Birthday. The party lasts for just under 2 hours, it took place in an annexed area off the main restaurant away from the other diners. 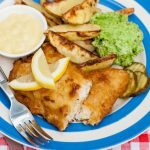 Considering a normal kids dinner menu would cost £6 anyway, the price of £11.95 per child is very reasonable. 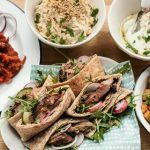 The minimum number of children for a Pizza Express kids party is seven and the maximum number may vary from branch to branch. We had twelve. 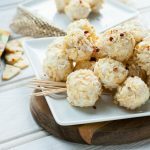 A balloon and Pizzaiolo certificate per child are included but you need to provide your own party bags and birthday cake. Having a waitress to hand out the food, top up drinks and clear tables was far more relaxed than a party at home. Having 2-3 other parents in attendance helps your pizzette from getting up to high jinks in the main restaurant area. Extra pizza and drinks for grown ups can be billed with the party or separately. I’d booked 2 weeks ahead and paid a £50 deposit. Pizza Express provide printed party invitations which saves you buying/designing these too. I still came home and collapsed in a heap but at least my house was tidy!! 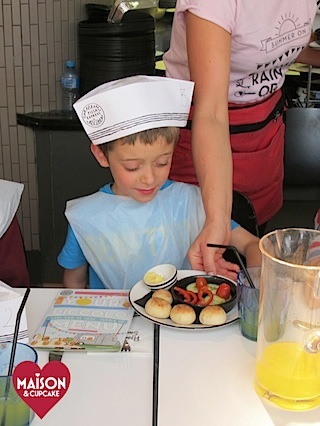 Have you ever attended kids Pizza Express parties? How did it go? 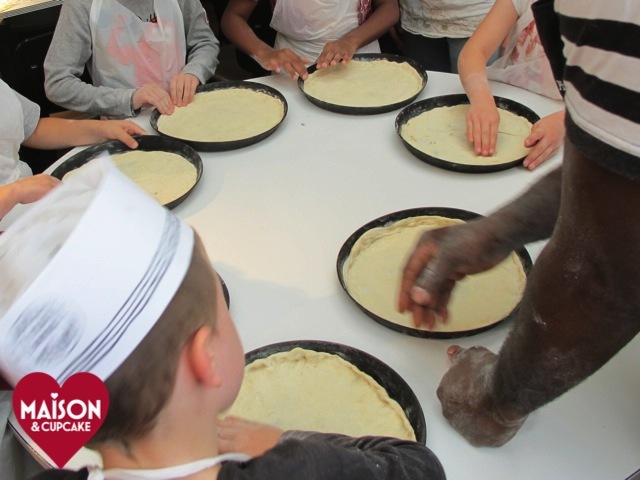 To check whether branches near you offer kids Pizza Express parties visit their website. This was a self funded review. Looks like Ted and his pals had an ace time!!!! Sam had the same party in January and I have to say I was hugely impressed by it! The kids were all really into it and it meant I didn’t have to tidy up or have kids ricocheting off the walls of our tiny house – result!!! I think it’s set a very high bar for future parties! Waitress service is the way to go! 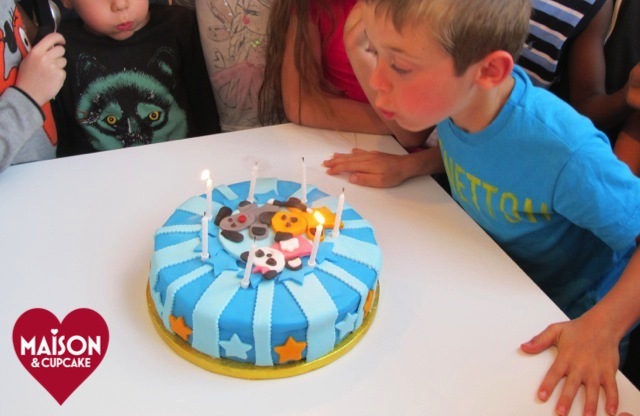 Looks like Ted and his friends had a ball Sarah and I am still in love with that Sooty cake! I would actually have a party like this myself. Is that something I should be embarrassed about? 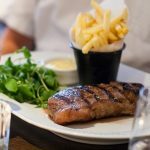 You know they do them for adults too, only it’s £21.95 and you get a glass of prosecco instead of a balloon. I highly recommend it, the children enjoyed it so much. 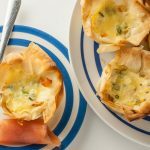 That looks fabulous! 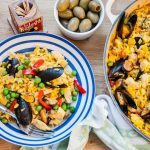 I went to a pizza party recently that was quite disappointing – the kids had to take it in turn to go into the kitchen, say what they wanted and the chef then made it – fun but not exactly hands on. This looks miles better. Think that’s JD’s next birthday party sorted. 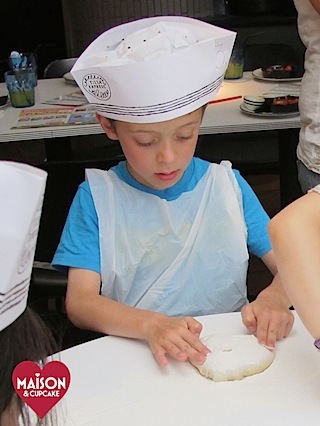 I’m hearing big thumbs up for pizza express kids parties from all quarters so looks like all branches do it same way. A pity you had a less successful experience elsewhere. What a fantastic alternative birthday party. Love it. 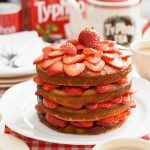 Brilliant idea for a low faff party, let someone else set up and clean up! Will definitely be thinking about this for 7yo’s next birthday as bubs is due 3 weeks before. Do it. You’ll be so glad you did! What a great idea and yes it looks like Ted and his pals had a fantastic time! I’d heard about these parties but never knew what happens in them – it looks like a lot of fun! I was incredibly impressed. Pity I can’t get away with doing the same next year!! this looks so good.id have it for adults though i wonder why its so much more expensive for them?